Eliminates stacking boards to stabilize the front end of your 5th Wheel. Does not include foot pad. Rated at over 5,000 lb. Installs in less than 60 seconds. I have a 5th wheel that came with these on the front landing gear and all was fine till one foot dropped off on the road somewhere. I found it very difficult to fine tune the leveling of the trailer with boards and got another adjuster right away. The adjuster bolt is peened at the end so the pad doesn't fall off, but I don't need to loose another one. I just pull the clip and pin when I hook up and store the adjuster and pad just to be on the safe side. 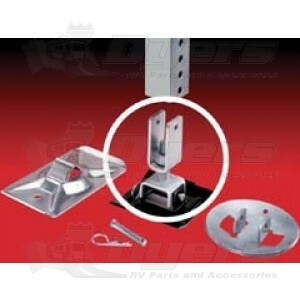 Every fifth wheel should be equiped with these.